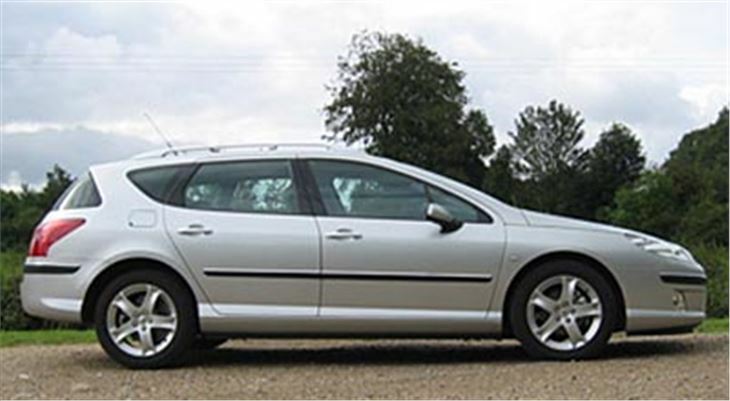 Two road tests in one this time, and a mystery solved for anyone wondering why Peugeot builds a 407SW as well as a 307SW. Also a paradoxical comparison between the 136bhp 2.0 HDI 16v in the smaller 307SW, and the 110bhp 1.6 HDI 16v in the larger 407. 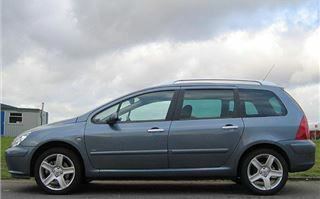 To make sense of the two cars, the 307SW is best thought of as a 7-seater MPV that looks like an estate car in the tradition of Peugeot - seater estates. 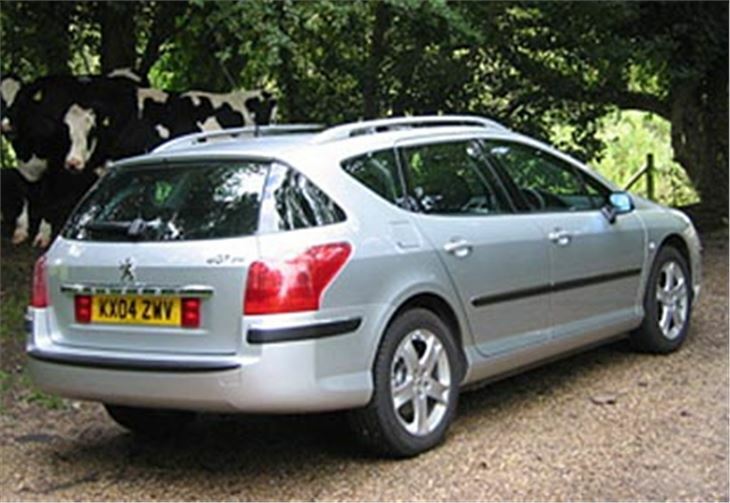 While the 407SW is a less practical, more stylish alternative to a hatchback in the manner of an Audi A4 Avant or Renault Laguna Sport Tourer. Of course, Renault takes all this one stage further by offering both a Megane estate and a 5 or 7-seater Megane Scenic MPV as well as the Laguna Sport Tourer, but we won’t go there right now. 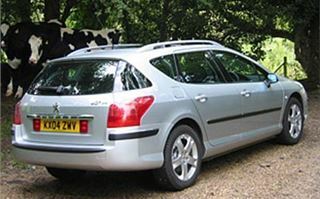 One thing is for sure: there is not another MPV anywhere in the world that outhandles the 307SW. It drives, grips and gives even more pleasure than the 307 hatchback. And with the 138PS (136bhp) 2.0 litre 16v HDI it’s geared to give 35mph per 1,000 rpm in 6th, so you can cruise all day at 90mph and around 2,500rpm. In fact, it’s so high geared that you need to use lower gears for lesser speeds: 5th is more appropriate for a 50 limit, 4th for 40mph contra-flows, and 3rd for 30mph limits. So while it’s a fantastic tourer and people mover, with that ultra-tall 6th it probably isn’t a very good caravan tower. 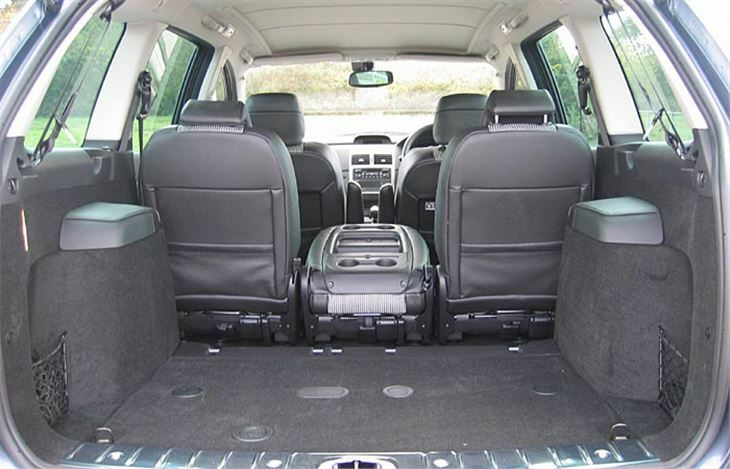 Inside, just like an MPV, you get three individual sliding, double-folding, removable centre-rear seats and two folding, removable forward-facing rearmost seats, which are sold as optional extras. Unlike an MPV, you also get a full-length heat-reflective glass roof that brightens up the interior on a sunny day and can be curtained off with an electric blind when the sun refuses to shine. Though a tad expensive at list prices of £17,520 for the SE HDI 136 and £18,420 for the XSI HDI 136 (plus £398 for the extra rear seats), the 307SW makes a very good case for itself as a ‘do anything car’. It’s a 7-seater that goes and handles like a sports car, yet only chucks out 148g/km CO2 and averages 50.4mpg on the combined cycle. And it has the very neat feature of door mirrors which automatically fold when you lock the car. What more could you want? Well, beauty is in the eye of the beholder, and you might want something less practical and altogether more stylish. On to the 407SW, then, which also has electric folding door mirrors and which, for sake of contrast, came with PSA’s 1.6 16v HDI 110 engine. This is rapidly becoming a universal engine, now offered in the Fiesta, Fusion, new Focus, C-MAX, 206, 307, Mazda 3, Citroen C4 and Citroen C5, as well as the 407. Because it revs easily to 5,000rpm+ it is one of the most petrol-like diesels you can buy. And in the 407 it’s extraordinarily refined. The only things that tell you it’s a diesel are a little bit of rattle at idle, and the usual turbodiesel whooph of torque between around 1,750 and 2,500rpm. This particular car had a bit less bite at the front than Peugeots usually do, so was very limo-like. But, despite the smoothness of the engine, after the 35mph per 1,000 rpm of the 2.0 16v HDI of the 307, the gearing of the 407 came as a bit of a shock. Sure it only has 5 speeds, but at 70mph it’s already turning 2,500rpm, so that’s about 23.5mph per 1,000 rpm in top; the same as a petrol Focus 1.6. For 407 impressions generally, please refer back to the 407 test at www.honestjohn.co.uk/road_tests/index.htm?id=127. Here we'll concentrate on what makes the SW better. The first thing is the semi-full length heat-reflective glass roof it shares with the 307SW. This turns the back seat from a gloomy, claustrophobic place to travel into a bright and cheerful place, even though you still can’t see forwards through the huge front seat head restraints. 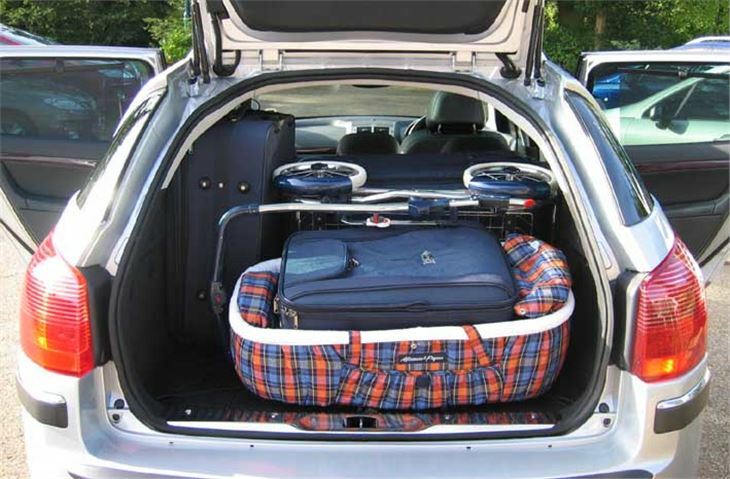 And, of course, it has a much more versatile luggage area than the saloon. This isn’t designed for carting furniture around. If you want to do that, buy the 307SW. 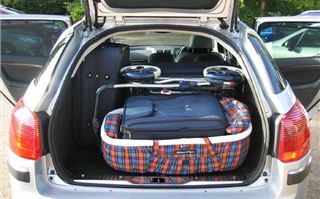 But does allow you to carry a fair amount of gear, as shown in the photo, has the advantage of a separately opening rear window, and also has a rear window wash/wipe. The premium over otherwise equivalent 407 saloons is a vicious £1,100; slightly more than the usual extra hit for a voluptuous full-bodied estate. 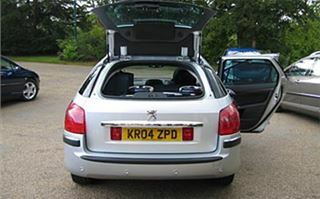 But this covers the Athermic glass roof as well as the rear window hatch. 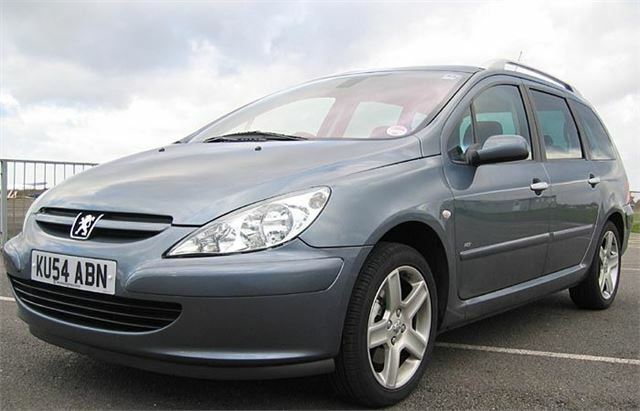 The 1.6 HDI 110 SE I drove was £17,900, and the 2.0 HDI 136 SE would have been £18,800. 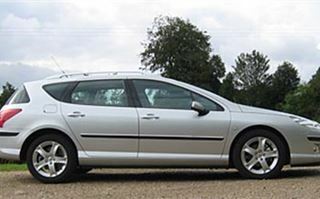 So, over and above the prices of the 307SW, you pay for style as well as losing practicality. But you have that alternative. And only Renault offers you a similar choice.